Bring 1 cup of distilled water to a boil on the stovetop. Add chamomile and rosemary, either in a tea ball or directly into the water, which you will strain later. Whisk to combine, then add bentonite clay, and whisk thoroughly. Allow to steep, with heat on low, for 30-40 minutes. Add more water as necessary if you see evaporation. After herbs have steeped, strain liquid into your chosen shampoo container, then add castile soap, almond oil, tea tree oil, and ylang ylang. Shake very well to combine, and be sure to shake immediately before each use. I just squirt the shampoo directly onto my head, lather up, let it sit for a minute or two while I shave and wash my body, and then rinse it out. Now, for my “conditioner,” the recipe is ridiculously simple. Ready? Use 1 part vinegar (Any type will do. 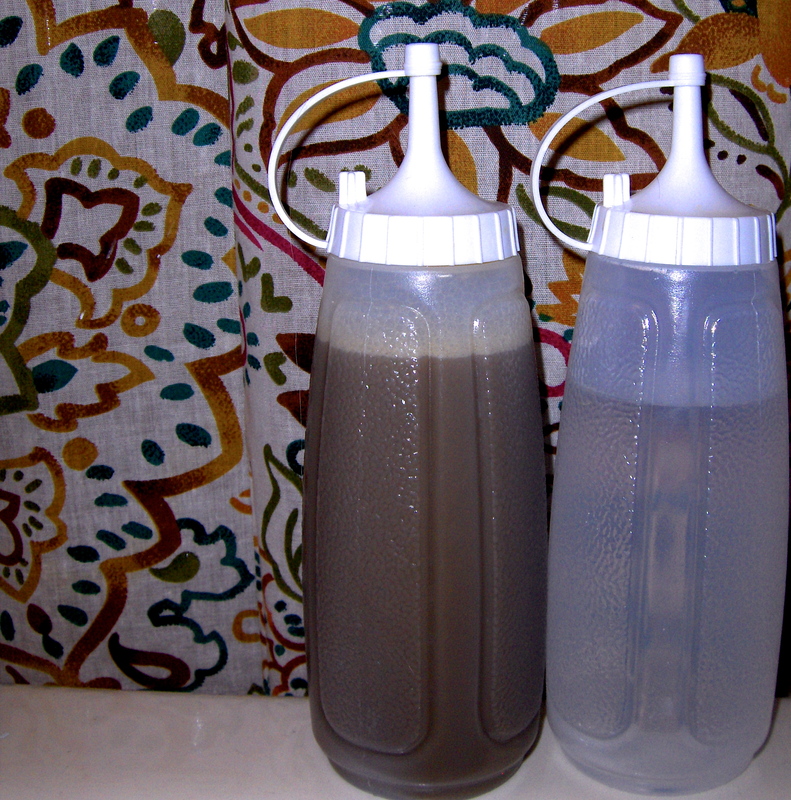 I like apple cider vinegar or plain white vinegar) and 1 part water in a condiment bottle. Shake before use, and apply to hair after rinsing out the shampoo. You can rinse out the vinegar, or just leave it on your hair. The smell will go away after a few minutes, and your hair will be left soft and amazingly detangled. If you want to get really fancy, you can make infused vinegar with orange or grapefruit peels, but the smell really is not noticeable by the time you’ve brushed and dried your hair. This entry was tagged castile, conditioner, diy, hair, homemade, natural, safe, shampoo, vinegar. Bookmark the permalink. Awesome! I’m totally making some! Thanks for the recipe! You bet 😉 I hope you like it! There’s a ton of variation possible, with whatever herbs have properties that you want in a shampoo, so you can play around with that as well.